Analysis Google has joined the battle to create a single-supplier smart-home with the release of a new product called the Home Hub. The Hub – launched today amid the official unveiling of Google's Pixel 3 and 3XL smartphones – is a semi-moveable dashboard with a screen that will communicate with smart home products from its Nest subsidiary as well as its music and TV services from YouTube and the central Google digital assistant. The idea is to create a Google ecosystem, where photos taken by your Android phone are automatically uploaded to the Hub so it can act as a digital photo frame, where you play music through YouTube, grab recipes through its search function, check out your daily schedule, and interact with your security cameras, video doorbell, thermostat, and smart lighting. The product is a direct challenge to other tech giants' effort to do the same: Amazon is using the success of its Alexa digital assistant to flood the market with all manner of related products in an effort to tie people into its products. And Apple continues to refine and push its HomeKit smart home system and tie people into its system. 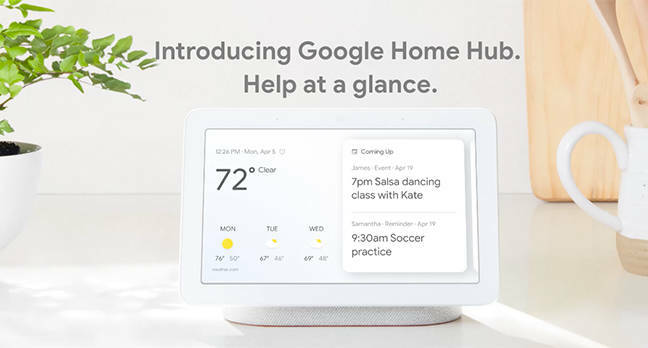 In that respect, the Google Home Hub is almost an exact replica of Amazon's Echo Show, which is also a screen with a built-in digital assistant that connects to various music and video services, most owned by Amazon, and anything that includes the Alexa system. It is likely no coincidence that Google is launching its Hub just two days before Amazon launches the second generation of its Show. In some respects, it was inevitable that smart homes would end up going down the path to a central control point and ecosystem: the smart home market is so disparate and flooded with competing standards that those companies that have tried to become single-point hubs – for example, Wink – have had limited success. What Google, Amazon, and Apple are able to do, which almost no other company can, is combine enough products and services that a standalone hub starts to make sense on its own, rather than be just an additional expense for convenience. Well, we just dug out the dusty box, plugged it in, updated it, and waited to see how much had changed. Sadly, but inevitably, very little has. Without the sway and fire power of mega corporations, Loop hasn't been able to cut the deals to turn it from a glorified digital picture frame into a home hub. Although why anyone would choose to buy hardware from a pure software company, especially one that has repeatedly been found to abuse its users' private data, is absolutely beyond us. The move does however point to the tech industry's growing certainty that home hubs represent a huge market opportunity. As to the details of Google's Home Hub. It is cheaper that its competitors: $149 where the new Amazon Echo Show is $229 and Facebook's Portal is $199/$349 depending on the size of the screen. Perhaps critically, it does not contain a camera: something that Google explicitly noted was so that people feel comfortable taking it with them into private places – like on your bedside table. It works with Google's Assistant and hardware. It has been designed to blend in with your home – the screen automatically adjusts to the level and type of light in the room. It piggybacks on the Nest ecosystem to work with all Nest devices, as well as other smart-home products that are part of the "works with Nest" program. And it has speakers and microphones so it can answer queries and play sound. In short, it looks like a very useful product that pulls together a series of useful functions and strengthens Google's position in what is a rapidly growing market. It also comes with a plus over Amazon and Facebook: it is slightly less commercial. Everybody knows that no matter what Facebook boss Mark Zuckerberg and his antisocial network says ("Facebook doesn't listen to, view, or keep the contents of your Portal video calls"), the Portal will be used to gather and sell your personal data. Likewise, Amazon just can't stop itself from trying to use its foothold in your home to get you to buy more things from its online store. Google will, of course, also use its Home Hub to try to make money from you: by storing all your requests for information, news, music, video, travel, etc, to your profile and then neatly package it all up for advertisers. But if you are willing to accept that proposition, it is less obnoxious than the alternatives. Plus Google has become, in part, a hardware company, so not all of its drive will be to make revenue from selling data grabbed by software. And it is pushing its cable-cutting YouTubeTV service, which costs $40 a month but which you currently get for free for six months when you buy a Hub (a value that is more than the actual cost of the device). And for those of you who would only accept such a product if it was designed not to gather information, then we point you to the Loop – which no one has bought. That, unfortunately, is the mechanics of the market. As to how good the Hub is, we'd have to wait when there are actual units to review. Google claims, of course, the gizmo has a wonderful screen and incredible speakers and a seamless experience. We shall see. As to whether this gives Google an edge over Amazon in the battle for the smart home ecosystem: right now, it probably does, but just a little. Increasingly, it seems likely that whatever company gets an initial foothold in your home, that will drive future purchasing decisions. That is likely to be behind what some are claiming is Walmart's insistence that any smart home products in its store work with Google Home and rumors that Walmart execs are actively discouraging manufacturers from supporting Amazon's Alexa system. If there was one thing that came out of Google's hardware launch today, it was that the internet goliath is willing to pay a lot of money to others in order to push into the market. Otherwise, why on Earth else would enormo-publisher Conde Nast have agreed to use its new Google Pixel smartphones for its most recent magazine cover shoots? And why would celebrity photographer Annie Leibovitz agree to use a mobile phone for said mag photos? It's not like she doesn't already have the very finest photographic equipment that is available to buy.